When you order your Mishloach Manos Baskets from Keren Chasanim, you are supporting a truly wonderful charity. All of the profits from the organization’s Basket Campaign are sent directly to hundreds of families who are in dire need of your help to marry their sons and daughters. Customers can choose from a variety of elegant gift baskets that contain cookies, candy, nuts, dried fruit, juice, wine and more. 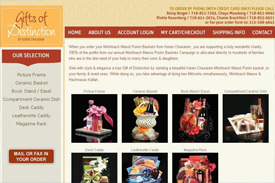 Customers can browse the site and find the basket of their choice. The user interface makes it easy for the merchant to make changes in the site’s content and add or replace basket designs as needed.